Whenever we head west out of Liskeard, we have the delight of driving down the glorious Glynn Valley. It makes for a fantastic mini road trip. Glynn is the Cornish word for a deep wooded valley, so the name is a bit of a tautology, but an attractive one. This eight mile stretch of the A38 links Liskeard to the A30 and runs along the edge of Bodmin Moor. It mostly follows a particularly attractive stretch of the River Fowey on its twisting and fast flowing way to meet the sea at Fowey. The interlocking hills either side are mostly covered in trees with intermittent glimpses of beautiful scenery. I always look forward to this part of the journey. This particular day, we were celebrating CTs birthday and taking a road trip down west to visit a garden we hadn’t seen before. As soon as I heard about MoneySupermarket’s £50 Road Trip Challenge, I knew immediately this would be the trip I would be writing about and the Glynn Valley would be the main feature. It was virtually impossible taking pictures from the car, so we stopped off in a couple of places to have a mooch about and take photographs. The grand views turned out to be too awkward to capture. Nice car, but sadly not the one we were driving. Not only is the Glynn Valley beautiful, it’s also remarkably interesting with much to see and do; you could spend a couple of days here doing your sightseeing dreckly (as we say down here). It starts with Carnglaze Caverns, which we passed by on this occasion. Famously used to store the Royal Navy’s supply of rum in the 2nd World War, it started life as a slate quarry. It’s now a visitor attraction with cavern tours and a fairy dell. It’s also a rather spectacular concert venue with excellent acoustics and a very steady temperature. We once had the pleasure of attending a Show of Hands concert there and can certainly attest to the sound quality. Driving on a little further we came to the glittering spires of the pile-it-high-sell-it-cheap retail park which is Trago Mills. A visit here can only be described as an “experience”. To get a taste as to what’s in store, here’s one of the many statues that adorn the site. Just up the road on the right is a lane leading to Pinsla Nursery. It’s run by the appropriately named Claire Woodbine (aka honeysuckle) and looks down over the valley. It sells some unusual plants and has an interesting and arty garden. Travelling on further, we had fleeting glimpses through the trees of the rather magnificent Glynn House. Rebuilt in 1805 by Edward John Glynn, High Sherif of Cornwall, it became a biological research institute in 1962. Rather sadly I feel, it has now been converted into luxury homes. The road curves, bends and weaves alongside the mainline railway on its way to Bodmin Parkway station. Then the railway parts company with the Glynn Valley and follows the River Fowey to Lostwithiel. Unusually, for a mainline station, Bodmin Parkway is set in rural isolation at the foot of the Lanhydrock Estate. Here you can depart the modern age, get cinders in your hair and take a ride on the Bodmin and Wenford steam train to Bodmin Central station. We pulled in to the car park to see whether there were any steam trains in the vicinity. There weren’t. Once owned by the Glynn family, Lanyhydrock is a vast and magnificent estate which now belongs to the National Trust. We decided to take a stroll up the old carriage way to the bridge over the River Fowey. Nice to have a station built just for you so you can travel in comfort to the ancestral pile after an all night blinder in London. The carriageway sports a lovely selection of rather grand trees and makes for a very pleasant walk through the estate. Walk a bit further and you can visit the Victorian mansion and beautiful listed. gardens. 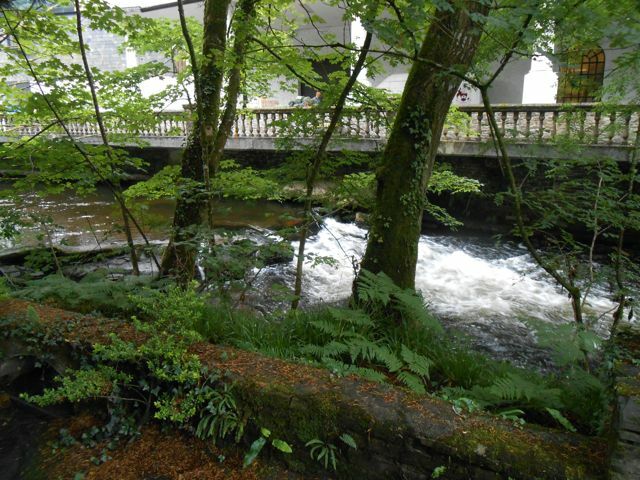 It’s a nice spot for lunch or a cream tea and you can walk it off by meandering back through the woods and along the river Fowey. Another mile or so further along the road, is the turn off to Cardinham Woods, a large tract of forestry, ideal for walking and mountain biking. For those less energetic, it has a nice cafe which is worth a visit if you are passing. It has also served as a venue for the Cornwall Clandestine Cake Club. Nice as it is, we decided not to stop this time. Almost at the head of the valley is Cornwall’s prettiest crematorium! Finally, we passed under the Halgavor bridge, a small but impressive suspension bridge used by cyclists following the National Cycle Route. At this point we left the Glynn Valley and drove down the A30 to our final destination, Penrose Water Gardens near Truro. We wandered amongst the several acres of lily ponds and were entertained by the antics of damsel flies, butterflies and ducklings. The cafe serves local food, mostly grown on site: a tour of the polytunnels left us in no doubt thats our attempts at productive home growing are somewhat amateurish. It has a good reputation and was certainly busy when we stopped by for lunch. We finished our meal with a banoffee pie for CT and a warm brownie with clotted cream for me. After all, no road trip is complete without chocolate. Happy birthday CT! It looks like you had a lovely day out. I did think that was the car that you were tootling about in. Thanks Kath, if the weather is good, you can always have a lovely day out here …. if! The car would have made tootling around so much more enjoyable. I have wonderful memories of a weekend when we visited several National Trust properties, including Lanhydrock. It was a magical place and I still have the tea towel and coasters I bought in the gift shop. As you say, no day out is complete without chocolate! Lanhydrock is wonderful, I feel very lucky to have it so close by. But I don’t have the tea towel and coasters. Looks a lovely day out – and I want that car! Haha, you are not the only one CC. I don’t know those parts of Cornwall at all. Fascinating! The brownie looks perfect. It’s very different to Penzance certainly, but lovely in it’s own right. Trago is an ‘experience’ that no one ever need try – I just can’t understand how anyone can see it as a day out! The rest is all fab though, and you’ve reminded me that I haven’t visited the cafe at Cardinham in an age, must go back soon! Amazingly, the car park is always full. Yes, we’ve been meaning to go to the cafe too but haven’t done so since CCC – shocking! How lovely Choclette. I would really love to visit your patch of Cornwall soon – it sounds wonderful! Thanks Charlotte. It’s a very different patch to the rest of Cornwall. Much quieter, but very pretty and I love it.